So in all my years of Bilgemunky.com, I’ve never reviewed a pirate app. I guess that’s largely because, until recently, I didn’t own a phone smart enough to handle such things. My phone was ok for making phone calls, was mil-spec rated for dust and vibration resistance, and could handle about 23 seconds of submergence in what I’d love to claim was rum, but was actually some sort of knockoff cool aid. Did I say 23 seconds? Cuz 24 seconds means it’s time to buy a new iPhone, as I recently learned. Yup, I can now review pirate apps! And it just so happens that one was recently brought to my attention. Bridge the Gap: a Pirate’s Life for Me! 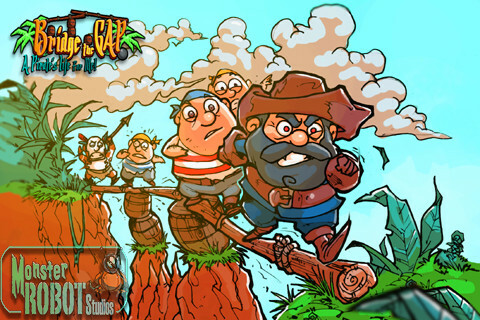 is a quasi-physics based game in which the player must prepare the rough terrain with bridges prior to releasing a crew of pirates who are far too trusting of rickety architecture. The “rough terrain” in this game is largely comprised of cliffs and jagged rocks, upon which our hapless pirates will gladly destroy themselves like so many cartoon lemmings if you fail to prepare a safe passage. Doing so requires dropping planks and barrels into makeshift bridges – easy enough at first, but increasingly difficult at higher levels. Gameplay is fun, albeit occasionally a little buggy, and the piratey graphics and sound effects are quite cute. And for only 99 cents, it provides more than enough challenging entertainment while waiting around for the train, bloodwork results, or the next episode of Bilgemunky Radio. This entry was posted in Games and tagged apps by Bilgemunky. Bookmark the permalink.